It’s time again for another Monday Monthly Mission; a time for empowerment, support, and discovery as we delve deeper into healthy living. After the month is up, we will reconvene and talk about our experiences, how we’ve overcome challenges, and share our tips for success! So without further ado, this month’s mission is OIL PULLING. I’m sure you’ve heard of it before but in case you haven’t the term “oil pulling” has been buzzing around the health blogosphere for a while. Oil pulling is an age-old Ayurvedic remedy where one swishes oil in their mouth first thing upon rising dating back thousands of years. To this day, it is widely used throughout Indian culture as a form of cleansing and detoxifying the body. Oil pulling is nothing new but to us westerners it’s all the rage for taking our health to the next level. Our mouths are riddled with all kinds of bacteria and microorganisms that influence our health. Different types of diseases also dictate the types of bacteria that inhabit the lining of the mouth, tongue, and throat. In fact, many diseases and cancers can be detected by the types of bacteria and other organisms present. If these organisms somehow enter the bloodstream they can really start to cause some serious problems. It is known that oral infections can infiltrate the bloodstream. An overabundance of bacteria in the mouth has also been known to trigger conditions like chronic fatigue, arthritis, and even diabetes. Oil pulling is an excellent way to improve oral health because it “pulls” away disease-causing bacteria and other toxins that live on and around the teeth and gums. You could conceivably assume that improving oral health will help improve overall health for this reason alone. So says the book “Oil Pulling Therapy” and I have to agree. The condition of our teeth, gums, and even the scent of our mouth tells us a lot about our overall well-being. There is a huge link between systemic disease and oral health. If you have a ton of cavities, gums that bleed easily, a discolored tongue, inflammation, and tartar buildup then your health is in decline. Conditions in our mouth can tell us a lot about our digestive tract too. If our gums are inflamed then our intestines are also inflamed. If we have a lot of cavities, then we may have a leaky gut and so on. Oil Pulling- The Next Holy Grail? It’s hard to believe that something so simple could be so effective. Compared to many medical treatments, oil pulling is super easy to do and completely harmless. It’s also cheap! What’s really impressive about oil pulling is its ability to help improve not only dental health, but a multitude of other issues as well. On top of all that your breath will be fresher longer and your teeth will be whiter and shinier! This is because plaque can no longer stick to your teeth and the oil dissolves stains and tartar. Wounds also heal much faster when you are oil pulling consistently. Or at least all disease reveals its presence in the mouth. Just as our eyes are the windows into our soul, ours mouths are the window to our health. There is a lot of evidence that oral health is directly related to debilitating/infectious diseases and may respond well to oil pulling. There are many people who have had positive results in their battles against all types of maladies and it certainly doesn’t hurt to add it to your current treatment plan with the permission of your health care practitioner. One thing to note is how your diet affects your oral health. When we eat a lot of carbs or sugary treats the bacteria in our mouth have a party and multiply substantially. As more and more bacteria build up and make house it’s easier for cavities and other oral conditions to form. As we know, letting these conditions run rampant without treatment can allow these conditions to infiltrate the bloodstream. Since brushing our teeth only reaches about 60% of the mouth it’s important to consider more options to reach the other 40% for this reason. Flossing and using an oral rinse is great an all, but oil pulling is better. Not only will the oil kill bacteria and other microorganisms it will also pull toxins from the mouth which is something other dental hygiene products cannot do. Another perk of oil pulling is whiter teeth and who doesn’t want sparkling pearly whites. I don’t know about you but I have always considered white teeth a sign of good health. If you think about it, many I can think of that stain teeth like soda, wine, tea, coffee, smoking, etc. are all things that aren’t particularly good for us. If your teeth are stained then it can be assumed that you do one or several of these things daily. We know that drinking too much coffee often leads to burned out adrenals because of caffeine and we know that smoking cigarettes causes lung disease. Drinking too much soda often leads to obesity and so on. Oil pulling not only helps keep our teeth whiter it also supports our health. Of course, oil pulling isn’t a cure all but it certainly helps when you can’t tone down your coffee addiction. 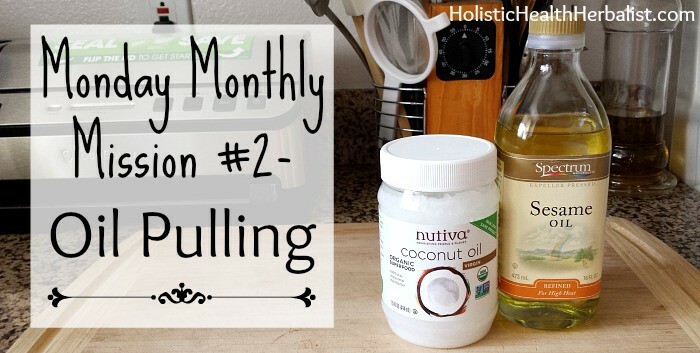 Oil pulling is so easy to do! All you need is sesame seed oil (not roasted) or coconut oil . Every morning when you wake up, before swallowing or drinking anything, swish 1 TB or less of oil in your mouth for 20 minutes. Yes, you read that right, 20 minutes. For many people this can be a bit challenging but I swear it gets easier with practice. If you have a gag reflex when swishing with pure oil try adding one drop of peppermint essential oil to help freshen things up. I also enjoy using Thieves oil for an added kick. It really helps! The important thing to remember is you must SWISH the oil for as long as possible. Sometimes I can’t do the full 20 minutes and that’s ok, but most mornings I can. The second important thing to remember is DON’T SWALLOW the oil. Oil pulling literally pulls toxins and bacteria from your gums, teeth, and throat. You don’t want to be swallowing this stuff. If you do on accident, it’s not harmful but you won’t be getting the yucky stuff out of your system. When you’re finished swishing the oil, you can spit it into a waste bin not the sink as it can clog it up over time. Repeat every morning for best results! Follow with your regular morning routine. Oil pulling may seem hard to fit into your morning routine but it’s easier than you think. I often oil pull while I fix my morning tea and check e-mails. Easy peasy! Got Plaque? Want to Detox? Try Oil Pulling! Oil Pulling 101: What and Why? Yes! Oil pulling is amazing for all kinds of things! Great information! Always wanted to learn more about oil pulling. This is great, definitely perfect for an oil pulling beginner like me. Thanks for sharing! Thanks for this post! I oil pull with sesame oil and stopped when I got super busy. SUCH a good reminder. I need to start again right away!! I love oil pulling! I noticed a huge improvement in my oral health when I started. I add a drop of clove oil to make it extra powerful. Great idea to add a drop of peppermint oil to the mix! I love oil pulling and have been doing it about 2 years with coconut oil most mornings. The past 2 dental appts. (last March and one before) I had no cavities. This is the longest time period I have gone without cavities in my adult life. I am very encouraged.